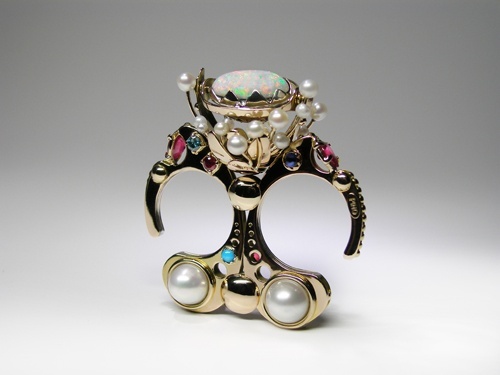 Throughout Canada, the United States, Asia, and Europe, Claudio Pino is renowned for his sculptural and kinetic rings. For the past two decades, the artist has devoted himself exclusively to the creation of one-of-a-kind pieces. In this solo exhibition, he presents more than 30 of these original creations, as he investigates “The Power of the Rings”.Inspired by the exploration of moving systems, of insect metamorphoses, and of the rhythm of urban life, his creations first come to life through his combinations of forms and colours. Pino is also passionate about gemstones, and is fascinated by their properties. He juxtaposes icy silvers with the warmth of gold, a peaceful emerald green with a flamboyant ruby red. From conception to creation, each ring arouses anew in-depth research into the meeting place between elegance and innovation, while bridging the gap between historical and modern esthetics. Captivated by the profound relationship between jewels and their owners, Pino creates rings that are unquestionably comfortable, that “belong” to the hand. He has even added miniscule mechanisms to some of his pieces to ensure that the gems set in them will follow the flow of the wearer’s gesticulations. His creations have enjoyed resounding success. He has won numerous awards and distinctions, including a special prize at the Cheongju International Craft Biennale, and the Metal Arts Guild of Canada’s Steel Trophy for Best Design 2009. 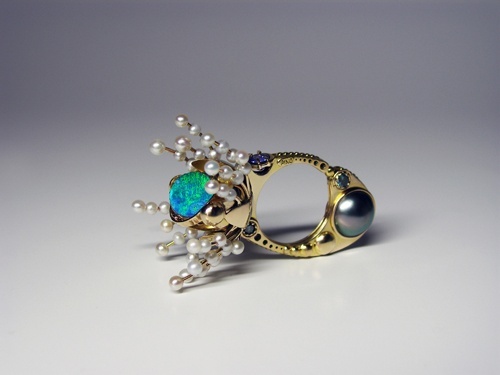 Claudio Pino – MYSTICAL FLOWERING 14KT GOLD, 925 SILVER, BLUE DIAMONDS, OPAL, TAHITIAN PEARLS, TANZANITE, FRESHWATER PEARLS.